Take your daily shower with ease by letting Luxury Bath Texoma install a barrier-free shower in your bathroom today! Providing superior bathroom accessibility products and professional roll-in shower installation in north Texas and southwest Oklahoma. 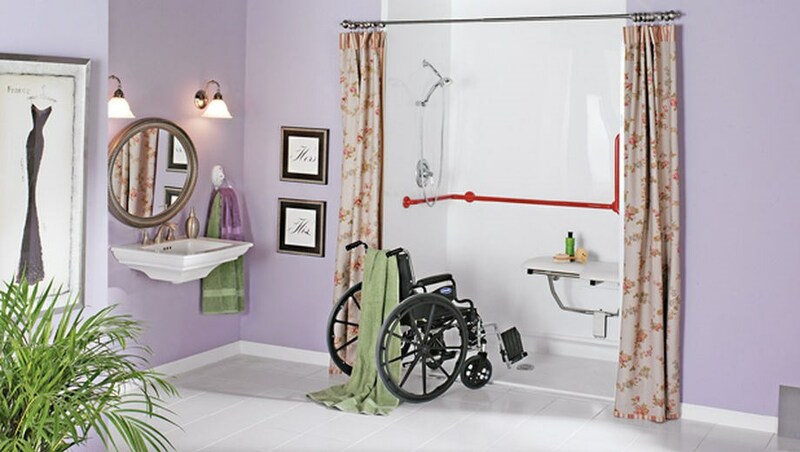 If you struggle with physical or age-related limitations, our premier barrier-free shower units are an excellent choice to keep your independence! Custom designed to fit into your existing space, our expert team will go above and beyond to install your new roll-in shower in just two days! Our exclusive collection of roll-in shower bases provides optimal accessibility without compromising style and luxury. Each of our barrier-free showers features an opening that is flush with the floor – making moving a wheel-chair in and out of the shower an effortless task! To complete the look of your new bathroom, our expert team can help you choose a shower surround or enclosure that best suits your needs. Shower Surrounds – Streamline your bathroom with our roll-in shower stalls that make getting in and out of your morning shower a breeze! Shower Enclosures – Our beautiful shower doors come with LuxSeal glass treatment to reduce cleaning by 90% and virtually eliminate hard water spots and mineral deposits! You can trust our showers to last. All of our products are made with the highest-quality material to ensure years of durable, low-maintenance beauty and function! Whether you are interested in a modern look or prefer traditional patterns, there is something for everyone with the designer colors and tile patterns available for the surround of your new roll-in shower. To get you started, one of our experienced designers will come to your home for a free consultation to help you choose the custom products that best suit your aesthetic and fit in your existing space. Colors & Patterns – Our expansive selection of colors and patterns will bring your bathroom to life! Fixtures & Hardware – Accessories are important, and Luxury Bath Texoma has the products you need for a perfect finishing touch. To start your remodel, call Luxury Bath Texoma and one of our experienced designers will come to your home for a free consultation! We'll help you choose the custom products that best suit your aesthetic and fit in your existing space.